Epithelial–mesenchymal transition in lung development and disease: does it exist and is it important? Epithelial–mesenchymal transition (EMT) is a process when epithelial cells gradually transform into mesenchymal-like cells losing their epithelial functionality and characteristics. EMT is thought to be involved in the pathogenesis of numerous lung diseases ranging from developmental disorders, fibrotic tissue remodelling to lung cancer. The most important question—namely what is the importance and contribution of EMT in the pathogenesis of several chronic lung conditions (asthma, COPD, bronchiolitis obliterans syndrome and lung fibrosis)—is currently intensely debated. This review gives a brief insight into the mechanism and assessment methods of EMT in various pulmonary diseases and summarises the recent literature highlighting the controversial experimental data and conclusions. During EMT, epithelial cells undergo profound changes which can be categorised into four broad cellular functions: changes in transcriptional regulation; changes in cytoskeleton and motility; changes in cell adhesion; and changes in the synthesis of extracellular matrix (ECM) components. The most important features of epithelial–mesenchymal transition (EMT). Multiple pathways have been found to trigger EMT: tyrosine kinase receptors (epidermal growth factor, fibroblast growth factor, connective tissue growth factor, platelet-derived growth factor, insulin-like growth factor, etc), integrins, Wnt, nuclear factor (NF)-κB and transforming growth factor β (TGF-β) pathways. A common feature of these pathways is that they activate ‘master transcription factors’ (Snail, Slug, Zeb-1, Twist, etc) which switch on the EMT programme in epithelial cells, namely, downregulating E-cadherin expression and other genes linked to the epithelial phenotype and activating the transcription of genes associated with the mesenchymal phenotype. Canonical TGF-β/SMAD signalling is perhaps the best characterised signalling pathway which contributes to fibrosis (for a recent review, see Fernandez et al90). Activation of canonical Wnt signalling and β catenin makes epithelial cells susceptible to EMT caused by TGF-β, by inhibiting the growth arrest which is induced by TGF-β. The extracellular matrix (ECM) also modulates TGF-β signalling through integrin signalling contributing to EMT. Inflammatory cytokines activating NF-κB are thought to further accentuate fibrosis and EMT in the lung. EMT is thought to be a gradual process, meaning that there are intermediate cellular phenotypes during the transition. An epithelial cell undergoing EMT will express a set of different marker genes during this process. Since changes in gene expression have also been detected during injury, activation or dedifferentiation of epithelial cells, it is obviously rather challenging to identify with certainty epithelial cells undergoing EMT in complex pathological conditions. There are numerous articles demonstrating that epithelial cells coexpress mesenchymal and epithelial markers in various lung diseases in humans.14–20 Other methods commonly used to identify EMT are to show the activation of signalling pathways and transcription factors thought to regulate EMT. These mechanisms—for example, the activation of transcription factors of the Snail family and the consequent downregulation of E-cadherin—show striking similarities between fibrosis, developmental programmes involving EMT and carcinogenesis, suggesting a common molecular regulatory background is present.21–23 However, these experimental methods only provide a ‘snapshot’ of a process stretched over a period of time and thus are criticised for not being suitable to follow a dynamic process like EMT. To solve this ongoing controversy there is a need for methods which are able to track the transdifferentiation process more reliably, like intravital microscopy or cell fate mapping. Recently published data have challenged the idea that a significant fraction of myofibroblasts in the diseased lung derive from epithelial cells in animal models29 ,31 and humans.32 These contradictive results from different laboratories have resulted in an intensive debate on lung fibrosis, and kidney33 ,34 and liver fibrosis.35 Rock et al used a transgenic mouse strain with a fluorescent protein tag (Tomato) under the control of the endogenous Sftpc promoter. These experiments suggests that AECs do not transdifferentiate into myofibroblasts in large numbers in the bleomycin lung injury model.29 A recently published study in mice using multiple genetic tags for cell fate tracking found that myofibroblasts in unilateral urethral obstruction (UUO) kidney fibrosis derive from proliferation of local precursors (50%), bone-marrow-derived fibrocytes (35%), endothelial-mesenchymal transition (10%) and EMT (5%).34 The study of LeBleu et al34 using the UUO model is a good example, highlighting the multiple origins of myofibroblasts. However, it is difficult to extrapolate from the UUO kidney fibrosis model to the lung as the organ function, the mechanism of parenchymal injury and consequent fibrotic changes are considerably different. These controversial data illustrate the ongoing intensive scientific debate on the origin of myofibroblasts in fibrotic diseases and tissue remodelling. Elucidating this further is crucial to determine the direction of future research and identification of new therapeutic targets. The first EMT event described occurs in gastrulation—the earliest stage of embryonic development. During this process, the primary mesenchyme is formed, giving the first distinction between epithelial and mesenchymal phenotypes. The epithelial and mesenchymal cell phenotypes are not irreversible, and during embryonic development, cells can convert between the epithelial and mesenchymal states through the process of EMT or mesenchymal-to-epithelial transition (MET).36 ,37 Sometimes, several rounds of EMT and MET are required to give a rise to specialised cell types needed for organ formation. During development, EMT provides flexibility in cell fate; however, the development of specialised tissues during embryogenesis requires additional epithelial cell plasticity that slightly differs from classical EMT. Epithelial cell plasticity is essential throughout the process of branching morphogenesis in numerous organs, including the lung.38 ,39 Lung-branching morphogenesis requires reciprocal signalling between the epithelium and surrounding mesenchyme that is mediated by coordinated activity of TGF-β/bone morphogenetic protein, Wnt, Sonic hedgehog, fibroblast growth factor (FGF) or retinoic acid signalling.40 Dysregulation of these signalling pathways is implicated in aberrant lung branching, alveologenesis and pulmonary vascular development, events critical for normal lung development. In addition to genetic factors, pre-natal and post-natal environmental exposures, including epigenetics, play a significant role in programming lung morphogenesis and development of paediatric lung disease. Bronchopulmonary dysplasia (BPD) is a chronic lung disease that occurs in very premature infants and is characterised by impaired alveologenesis and vascular development. BPD develops as a result of injury or infection on a very immature lung. Interstitial fibrosis is recognised as a prominent feature of BPD as a consequence of repetitive lung injury. Deng and coworkers,41 using transgenic reporter mice, showed that lung fibroblasts in BPD could arise from bone-marrow-derived ATII cells that have undergone EMT. Noseda and colleagues42 ,43 revealed that expression of Notch1 or Notch4 in endothelial cells can cause transition to a mesenchymal phenotype via endothelial-to-mesenchymal transition, a process very similar to EMT. Constitutive Notch1 activation, together with inhibitor studies in lung organ cultures, identified a role for Notch signalling together with TGF-β in mesothelial EMT.44 Que et al45 have also shown that mesothelial cells covering the lung surface can migrate into the organ itself and give rise to various cell types, including mesenchymal cells, within the developing lung. Taken together, these findings have important implications for our understanding of lung developmental defects; however, the casual impact of EMT to BPD has yet to be determined. Concerning the pathogenesis of asthma, does EMT contribute to tissue remodelling and sub-epithelial fibrosis? Johnson and colleagues28 found evidence for this phenomenon in a house dust mite (HDM) allergen sensitised transgenic murine model. They demonstrated that β-galactosidase-tagged large airway epithelial cells gradually lose epithelial characteristics, gain expression of mesenchymal markers, for example, vimentin, and migrate into the sub-epithelial compartment.28 In vivo cell-fate tracking of genetically labelled epithelial cells provides evidence for epithelial cell transdifferentiation in this mouse model of chronic asthma. Other studies use primary human bronchial epithelial cell (hBEC) cultures to study the role of allergen sensitisation in EMT. HDM sensitisation of the airways synergises with TGF-β1 and results in the loss of E-cadherin expression,47 caveolin-1 internalisation and consequent loss of epithelial barrier function.46 Hackett et al14 investigated EMT using air–liquid interface cultures of hBECs isolated from patients with asthma and non-asthmatic controls. The authors found that basal cells of the stratified airway epithelium are the most susceptible to TGF-β1-induced EMT. Interestingly, they found no histological evidence for expression of mesenchymal markers in the bronchial epithelium of matched patients with asthma, rather an increased number of cytokeratin-5+ (KRT5+) positive cells, indicating a differentiation shift towards the basal epithelial cell phenotype.14 The results discussed above highlight the controversy and discrepancy between research data concerning EMT. The histological finding characteristic for idiopathic pulmonary fibrosis (IPF) is usual interstitial pneumonia (UIP) with scattered α-SMA-positive fibroblastic foci (FF) in collagen-rich areas, alternating with normal lung areas. The most often used animal model for IPF is the single-dose bleomycin challenge, although it is known that several features of IPF—most importantly being a progressive and chronic disease—are poorly represented. Also, many drugs including corticosteroids proved to be effective in the bleomycin model but are ineffective in IPF.65 A recently published study suggests that a repetitive bleomycin injury model recapitulates several features of human IPF better than the conventional single-dose model. In this model the authors found that about 50% of S100A4+ fibroblasts are epithelial derived using genetic fate tracking.27 On the contrary, Rock et al29 found that epithelial cells do not contribute to fibroblast formation in the single-dose model. Human immunohistochemistry studies on the role of EMT in the formation of myofibroblasts in IPF are controversial.66 Harada et al67 found myofibroblast cells in FF expressing epithelial markers TTF-1, cytokeratin and surfactant protein B. Chilosi et al68 identified migratory markers laminin5-γ2, heat shock protein 27 and fascin expression in epithelial cells clustering above FF in UIP samples with special ‘sandwich morphology’. On the contrary, Yamada et al32 did not find histological evidence for EMT in tissue samples from patients diagnosed with IPF (n=15) and non-specific interstitial pneumonia (n=12) using dual immunohistochemistry. In conclusion, the evidence that EMT is involved in the formation of activated myofibroblasts in pulmonary fibrosis remains controversial. EMT is thought to contribute to cancer invasion and metastasis by allowing malignantly transformed epithelial cells to migrate, invade the surrounding stroma, and spread through the blood and lymphatic system to distant sites. Through the process of EMT, cancer cells not only lose their cell–cell adhesions and exhibit elevated motility and invasion, but also gain increased resistance to apoptosis, chemotherapeutic drugs and even develop stem-cell like properties.69 According to current views, EMT has prognostic significance in various cancers as it is highly correlated with invasive phenotype and metastasis-forming capacity. This so-called ‘EMT phenotype’ is a primary determinant of prognosis.70 It has been shown in non-small-cell lung cancer that EMT phenotype is associated with epidermal growth factor receptor mutations and drug resistance,71 and also with formation of cancer stem cells.70 In lung cancer, the circulating tumour cells (CTCs) expressing epithelial marker EpCAM are lower compared with other solid tumours.72 However, when CTC isolation is not based on epithelial markers, the CTC numbers are similar to those of other solid tumours and have strong prognostic value.73 These data suggest that lung cancer CTCs have lost their epithelial characteristics having undergone EMT. A recent review suggests that anticancer and antimetastasis drugs frequently have side effects associated with defective wound healing, implicating that similar molecular pathways contribute to these processes.12 However, despite the growing body of evidence, there is still no direct proof in humans that EMT actually happens as a dynamic process in tumour metastasis formation. What is the clinical importance of EMT? Two disease groups need to be considered concerning the clinical importance of EMT in the lung: conditions with fibrosis and tissue remodelling, and malignant lung diseases. It has been recently highlighted that various forms of lung fibrosis and tissue remodelling are present in all chronic respiratory diseases.74 Current research data highlight that we have to be careful on judging how much EMT contributes to the actual fibrosis, scarring and tissue remodelling. Among the identified targets is the TGF-β pathway and other growth factors, like PDGF, CTGF, FGF and vascular endothelial growth factor, which are considered to trigger EMT and have a proven pathogenic role in fibrotic lung diseases.75–78 Most of these molecular targets have been tested in animal models77 ,79 ,80 but there has been no success so far in translating these findings to the clinic.81 Pirfenidone is the only licensed therapy for IPF82 but the mechanism of action is obscure and there are no in vivo data available of its effects on EMT. For a concise summary of recent articles on EMT in lung diseases, please see the table in the online supplement. In the case of fibrotic changes, genetic lineage tagging of cells in animal models is thought to be a reliable method; however, the results are contradictory in different animal models for lung fibrosis and other organ fibrosis models.33 It seems that the results in transgenic mice differ with regards to the nature of the genetic tag, the method used for its detection and also the quality of the transgenic construct used for recombination. A large proportion of the in vivo data on the connection between fibrosis and EMT have been obtained from the single-dose pulmonary bleomycin challenge model. This has received criticism and clearly there is a need for the development of a more reliable murine lung fibrosis model that accurately reflects human UIP. In conclusion, much recent research has highlighted the potential of EMT to be involved in lung development and disease responses. The precise clinical importance of EMT outside of tumour biology remains to be determined, but the development of drugs that target growth factors known to promote EMT suggest that modulation of EMT processes in the clinical setting may soon be possible. Whether these are clinically effective remains to be seen.
. Epithelial mesenchymal transition and lung cancer. J Thorac Dis 2010;2:154–9.
. The basics of epithelial–mesenchymal transition. J Clin Invest 2009;119:1420.
. Functional Wnt signaling is increased in idiopathic pulmonary fibrosis. PLoS ONE 2008;3:e2142.
. Wnt signalling in lung development and diseases. Respir Res 2006;7:15.
. Biomarkers for epithelial–mesenchymal transitions. J Clin Invest 2009;119:1429–37.
. Clinical significance of S100A4 and E-cadherin-related adhesion molecules in non-small cell lung cancer. Int J Oncol 2000;16:1125–31.
. Unravelling the progressive pathophysiology of idiopathic pulmonary fibrosis. Eur Respir Rev 2012;21:152–60.
. Epithelial cell α3β1 integrin links β-catenin and Smad signaling to promote myofibroblast formation and pulmonary fibrosis. J Clin Invest 2009;119:213–24.
. Alveolar epithelial cell mesenchymal transition develops in vivo during pulmonary fibrosis and is regulated by the extracellular matrix. Proc Natl Acad Sci USA 2006;103:13180–5.
. Regenerative activity of the lung after epithelial injury. Biochim Biophys Acta 2013;1832:922–30.
. Developmental transcription factor slug is required for effective re-epithelialization by adult keratinocytes. J Cell Physiol 2005;202:858–66.
. A comparison of epithelial-to-mesenchymal transition and re-epithelialization. Semin Cancer Biol 2012;22:471–83.
. Organization and formation of the tight junction system in human epidermis and cultured keratinocytes. Eur J Cell Biol 2002;81:253–63.
. Induction of epithelial–mesenchymal transition in primary airway epithelial cells from patients with asthma by transforming growth factor-β1. Am J Respir Crit Care Med 2009;180:122–33.
. Posttransplant bronchiolitis obliterans syndrome is associated with bronchial epithelial to mesenchymal transition. Am J Transplant 2009;9:727–33.
. Epithelial to mesenchymal transition (EMT) and airway remodelling after human lung transplantation. Thorax 2009;64:770–7.
. Epithelial–mesenchymal interactions in the pathogenesis of asthma. J Allergy Clin Immunol 2000;105:193–204.
. Evaluation of epithelial mesenchymal transition in patients with chronic obstructive pulmonary disease. Respir Res 2011;12:130.
. Transforming growth factor beta (TGF-β) and obliterative bronchiolitis following pulmonary transplantation. J Heart Lung Transpl 1999;18:828–37.
. Reticular basement membrane fragmentation and potential epithelial mesenchymal transition is exaggerated in the airways of smokers with chronic obstructive pulmonary disease. Respirology 2010;15:930–8.
. SNAI transcription factors mediate epithelial–mesenchymal transition in lung fibrosis. Thorax 2009;64:1053–61.
. The developmental transcription factor slug is widely expressed in tissues of adult mice. J Histochem Citochem 2004;52:959–65.
. The EMT regulator slug and lung carcinogenesis. Carcinogenesis 2011;32:1299–304.
. Origin of interstitial fibroblasts in an accelerated model of angiotensin II-induced renal fibrosis. Am J Pathol 2005;167:1193–205.
. Localized and reversible TGF[beta] signalling switches breast cancer cells from cohesive to single cell motility. Nat Cell Biol 2009;11:1287–96.
. Contribution of epithelial-derived fibroblasts to bleomycin-induced lung fibrosis. Am J Respir Crit Care Med 2009;180:657–65.
. Repetitive intratracheal bleomycin models several features of idiopathic pulmonary fibrosis. Am J Physiol Lung Cell Mol Physiol 2010;299:L442–L52.
. Chronic respiratory aeroallergen exposure in mice induces epithelial–mesenchymal transition in the large airways. PLoS One 2011;6:e16175.
. Multiple stromal populations contribute to pulmonary fibrosis without evidence for epithelial to mesenchymal transition. Proc Natl Acad Sci USA 2011;108:E1475–E83.
. Conditional gene expression in the respiratory epithelium of the mouse. Transgenic Res 2002;11:21–9.
. An essential role for resident fibroblasts in experimental lung fibrosis is defined by lineage-specific deletion of high-affinity type II transforming growth factor β receptor. Am J Respir Crit Care Med 2011;183:249–61.
. Dual-immunohistochemistry provides little evidence for epithelial–mesenchymal transition in pulmonary fibrosis. Histochem Cell Biol 2008;129:453–62.
. Scar wars: mapping the fate of epithelial–mesenchymal–myofibroblast transition. Kidney Int 2011;80:41–50.
. Origin and function of myofibroblasts in kidney fibrosis. Nat Med 2013;19:1047–53.
. What's new in liver fibrosis? The origin of myofibroblasts in liver fibrosis. J Gastroenterol Hepatol 2012;27:65–8.
. Epithelial–mesenchymal transitions in development and disease. Cell 2009;139:871–90.
. Conserved patterns of cell movements during vertebrate gastrulation. Curr Biol 2005;15:R213–R28.
. Collective cell migration. Annu Rev Cell Dev Biol 2009;25:407–29.
. Morphogenesis of epithelial tubes: insights into tube formation, elongation, and elaboration. Dev Biol 2010;341:34–55.
. Preparing for the first breath: genetic and cellular mechanisms in lung development. Dev Cell 2010;18:8–23.
. Characterization of fibroblasts recruited from bone marrow-derived precursor in neonatal bronchopulmonary dysplasia mice. J Appl Physiol 2011;111:285–94.
. Smooth muscle alpha-actin is a direct target of Notch/CSL. Circ Res 2006;98:1468–70.
. Notch activation results in phenotypic and functional changes consistent with endothelial-to-mesenchymal transformation. Circ Res 2004;94:910–17.
. Canonical Notch signaling in the developing lung is required for determination of arterial smooth muscle cells and selection of Clara versus ciliated cell fate. J Cell Sci 2010;123(Pt 2):213–24.
. Mesothelium contributes to vascular smooth muscle and mesenchyme during lung development. Proc Natl Acad Sci USA 2008;105:16626–30.
. Caveolin-1 controls airway epithelial barrier function. Implications for Asthma. Am J Resp Cell Mol Biol 2013;49:662–71.
. House dust mite–promoted epithelial-to-mesenchymal transition in human bronchial epithelium. Am J Resp Cell Mol Biol 2010;42:69–79.
. Altered matrix production in the distal airways of individuals with asthma. Thorax 2010;65:670–6.
. Transforming growth factor β: a central modulator of pulmonary and airway inflammation and fibrosis. Proc Am Thorac Soc 2006;3:413–17.
. Phenotype of airway epithelial cells suggests epithelial to mesenchymal cell transition in clinically stable lung transplant recipients. Thorax 2005;60:865–71.
. Pseudomonas aeruginosa accentuates epithelial-to-mesenchymal transition in the airway. Eur Respir J 2011;37:1237–47.
. Hypoxia-induced alveolar epithelial–mesenchymal transition requires mitochondrial ROS and hypoxia-inducible factor 1. Am J Physiol Lung Cell Mol Physiol 2009;297:L1120–L30.
. Adenovirus-mediated HIF-1α gene transfer promotes repair of mouse airway allograft microvasculature and attenuates chronic rejection. J Clin Invest 2011;121:2336–49.
. Immunosuppression-induced bronchial epithelial–mesenchymal transition: A potential contributor to obliterative bronchiolitis. J Thorac Cardiovasc Surg 2011;141:523–30.
. Thorax in focus: chronic obstructive pulmonary disease. Thorax 2012;67:171–6.
. Chromosome 4q31 locus in COPD is also associated with lung cancer. 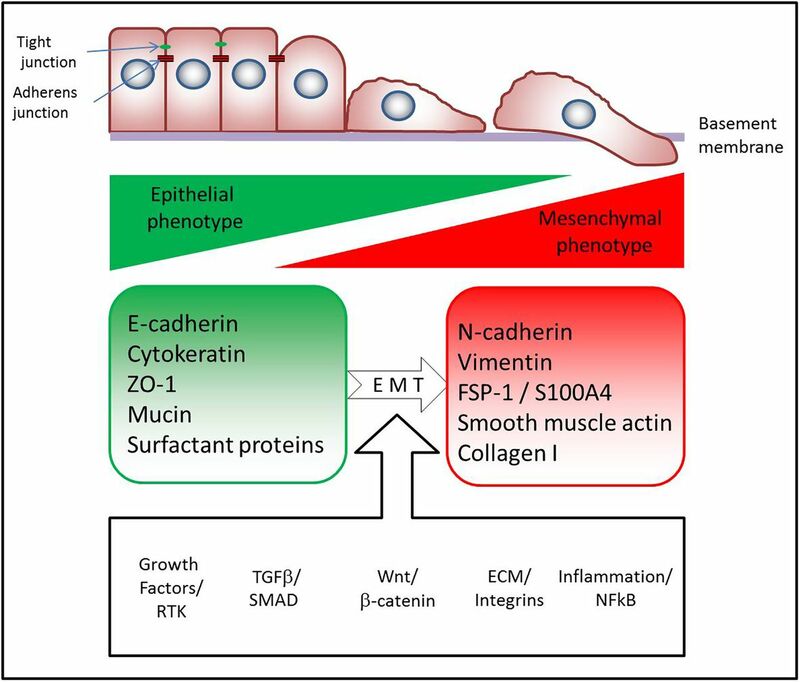 Eur Respir J 2010;36:1375–82.
. Nicotine-induced epithelial–mesenchymal transition via Wnt/β-catenin signaling in human airway epithelial cells. Am J Physiol Lung Cell Mol Physiol 2013;304:L199–209.
. The role of uPAR in epithelial–mesenchymal transition in small airway epithelium of patients with chronic obstructive pulmonary disease. Respir Res 2013;14:67.
. Cigarette smoke drives small airway remodeling by induction of growth factors in the airway wall. Am J Respir Crit Care Med 2006;174:1327–34.
. P68 RNA helicase mediates PDGF-induced epithelial mesenchymal transition by displacing Axin from β-catenin. Cell 2006;127:139–55.
. TGFβ stimulated re-epithelialisation is regulated by CTGF and Ras/MEK/ERK signalling. Exp Cell Res 2008;314:131–42.
. EMT: when epithelial cells decide to become mesenchymal-like cells. J Clin Invest 2009;119:1417–9.
. Epithelial–mesenchymal transitions: the importance of changing cell state in development and disease. J Clin Invest 2009;119:1438–49.
. Epithelial to mesenchymal transition is increased in patients with COPD and induced by cigarette smoke. Thorax 2013;68:410–20.
. The bleomycin animal model: a useful tool to investigate treatment options for idiopathic pulmonary fibrosis? Int J Biochem Cell Biol 2008;40:362–82.
. Incomplete expression of epithelial–mesenchymal transition markers in idiopathic pulmonary fibrosis. Pathol Res Pract 2011;207:559–67.
. Epithelial–mesenchymal transition in human lungs with usual interstitial pneumonia: quantitative immunohistochemistry. Pathol Int 2010;60:14–21.
. Migratory marker expression in fibroblast foci of idiopathic pulmonary fibrosis. Respir Res 2006;7:95.
. Epithelial mesenchymal transition and lung cancer. J Thorac Dis 2010;2:154.
. Regulatory networks defining EMT during cancer initiation and progression. Nat Rev Cancer 2013;13:97–110.
. An epithelial–mesenchymal transition gene signature predicts resistance to EGFR and PI3K inhibitors and identifies Axl as a therapeutic target for overcoming EGFR inhibitor resistance. Clin Cancer Res 2013;19:279–90.
. Evaluation and prognostic significance of circulating tumor cells in patients with non–small-cell lung cancer. J Clin Oncol 2011;29:1556–63.
. Preoperative circulating tumor cell detection using the isolation by size of epithelial tumor cell method for patients with lung cancer is a new prognostic biomarker. Clin Cancer Res 2011;17:827–35.
. Epithelial-mesenchymal interactions in pulmonary fibrosis. Annu Rev Physiol 2011;73:413–35.
. Current and novel drug therapies for idiopathic pulmonary fibrosis. Drug Des Dev Ther 2012;6:261.
. Targeting TGFβ superfamily ligand accessory proteins as novel therapeutics for chronic lung disorders. Pharm Ther 2012;135:279–91.
. The potential use of tyrosine kinase inhibitors in severe asthma. Curr Opin Allergy Clin Immunol 2012;12:68–75.
. Activation of canonical Wnt signalling is required for TGF-β-mediated fibrosis. Nat Commun 2012;3:735.
. TGF-β-neutralizing antibodies improve pulmonary alveologenesis and vasculogenesis in the injured newborn lung. Am J Physiol Lung Cell Mol Physiol 2007;293:L151–L61.
. Manipulation of allergen-induced airway remodeling by treatment with anti-TGF-β antibody: effect on the Smad signaling pathway. J Immunol 2005;174:5774–80.
. Recombinant human anti–transforming growth factor β1 antibody therapy in systemic sclerosis: a multicenter, randomized, placebo-controlled phase I/II trial of CAT-192. Arthritis Rheum 2007;56:323–33.
. Pirfenidone for IPF: pro/con debate; the ‘con’ viewpoint. Thorax 2013;68:605–8.
. Noncanonical WNT-5A signaling regulates TGF-β-induced extracellular matrix production by airway smooth muscle cells. FASEB J 2013;27:1631–43.
. Role of aberrant WNT signalling in the airway epithelial response to cigarette smoke in chronic obstructive pulmonary disease. Thorax 2013;68:709–16.
. Down-regulation of canonical and up-regulation of non-canonical Wnt signalling in the carcinogenic process of squamous cell lung. PLoS ONE 2013;8(3):e57393.
. Blockade of the Wnt/β-catenin pathway attenuates bleomycin-induced pulmonary fibrosis. Tohoku J Exp Med 2011;223:45–54.
. Inhibition of Wnt/β-catenin/CREB binding protein (CBP) signaling reverses pulmonary fibrosis. Proc Natl Acad Sci USA 2010;107:14309–14.
. Prostacyclin inhibits non small cell lung cancer growth by a frizzled 9 dependent pathway that is blocked by secreted frizzled related protein 1. Neoplasia 2010;12:244–53.
. EMT in carcinoma progression and dissemination: Facts, unanswered questions, and clinical considerations. Cancer Metastasis Rev 2012;31:277–83.
. The impact of TGF-β on lung fibrosis: from targeting to biomarkers. Proc Am Thorac Soc 2012;9:111–16. Contributors DB, NM, RYM, OE and DRT wrote and edited the manuscript. Funding DB is currently funded by the FP7 Marie Curie Intra-European Fellowship (FP7-PEOPLE-IEF 300371) and received funding from the European Respiratory Society Long Term Fellowship (ERS-LTRF 2011–131).